So I’m going to be a little bit virtuous over the next few weeks in the food that I cook. I’ve decided to join Weight Watchers to kick start my healthy eating regime. I’m pretty surprised I joined actually, as ordinarily I’m a big believer in ‘everything in moderation, including moderation’, but a friend recommended it to me and she’s quite similar to me in terms of food, cooking and health! At first I was a little bit concerned that my healthy eating might make this blog a little dull, but I’m actually thinking it might be a nice challenge. Can I find recipes that are genuinely good for you (and low in points!) but that still pack a punch in terms of flavour? It’s early days, but there are certainly recipes out there that seem to strike that balance. In fact, the Pork Bun Cha I made here is a really good example – massive flavour, and only 11 points. To the non Weight Watcher, that’s quite good for a dinner! The one thing, though, that I’ve realised quickly is that portion size is critical. So bear in mind that the servings guide is pretty strict…if you’re not fussed about calorie counting, take those with a pinch of salt! 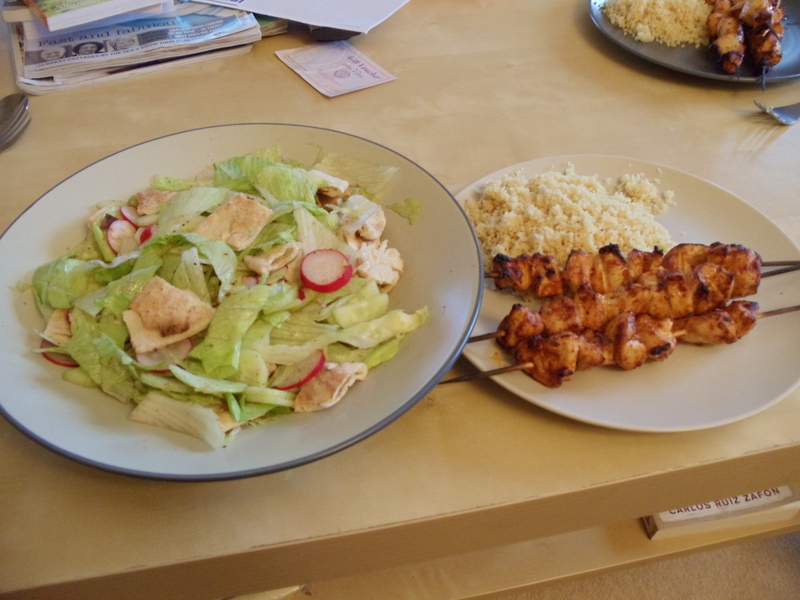 The first Weight Watchers recipe I tried was Lemon & Courgette Chicken Skewers and, on the whole, was a great success. The flavours are lovely and light, it’s really quick and simple to make for a midweek dinner and it’s good for you. I served with couscous and the recommended portion size for this was 30g per person! That’s about half of what I’d usually do, which looked quite stingy on the plate but actually did fill me up! But you only get 1 skewer per person – I cheated and had two, but even with the extra skewer the total points for dinner were 7. Good stuff! 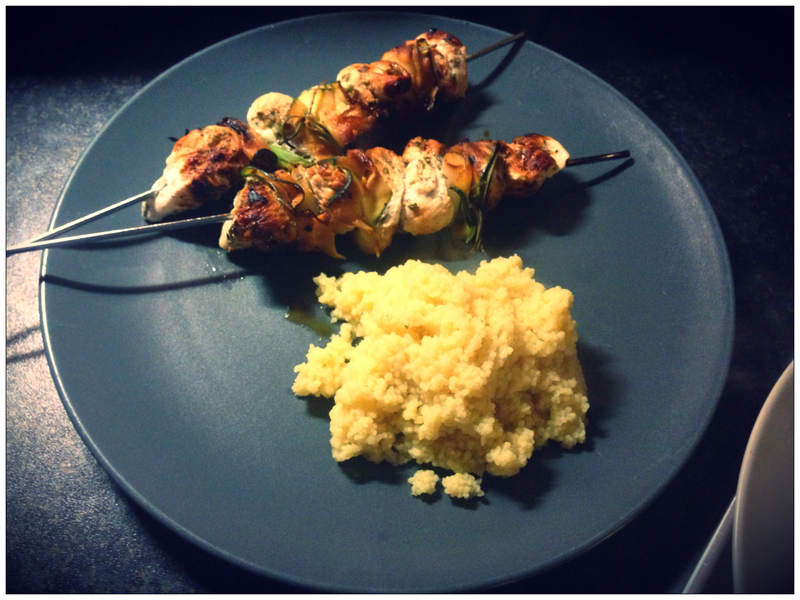 They do ask you to thread the chicken onto rosemary stalks as skewers – erm, no. Not my idea of fun so I stuck with my metal skewers to save my sanity! WW Points: 2 points per skewer. Put the chicken into a bowl with the yogurt, mint, honey and lemon. Turn to coat and season. Thread onto the rosemary sprigs (if using), alternating with the spring onion and a ribbon of courgette. Barbecue or griddle over a low heat for 10-12 minutes or until the chicken is completely cooked through. Categories: Chicken, Reidbury Recipes | Tags: Chicken, low calorie, Weight Watchers | Permalink. 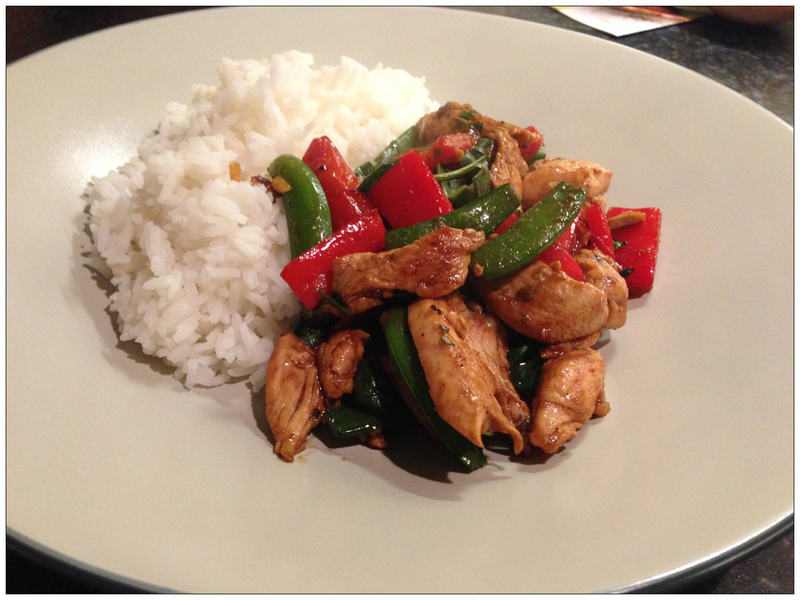 Thai Chicken with Basil and Chillies – Old School Style! Whilst I was at home over Easter I had my obligatory hour or so looking at all of Momma Bury’s cookbooks. She’s got hundreds and whilst my Dad might not fully understand why she keeps ‘needing’ to acquire more, I can’t help but agree with her! Cookbooks sit on the shelf, full of possibility, and sometimes they are like little historical artefacts that take you back in time and remind you of your previous food phases. And as I was flicking through the bookshelves I saw a book that took me right back to my youth – it’s a dated looking book called Home from Work Suppers by Sara Buenfield and if you want to see the retro cover it’s available here. I remember my Mum re-finding her love of cooking and I’m sure it was around the time she bought this book. There’s actually some lovely recipes in there, but the one I remember being a favourite when I was around 15 was Thai Chicken with Basil and Chillies. It was slightly ahead of it’s time – nowadays there’s huge volumes dedicated to every type of Asian cuisine, but this recipe still had to describe what fish sauce is, and how to substitute it if you can’t get hold of it. Now I LOVE Thai food, and so does Paul, so I wanted to see if this recipe would live up to my memory, especially given the ingredients that are now so prevalent in even the smallest of supermarkets (galangal, palm sugar and the like). Now, whilst I wouldn’t say this recipe is the best to try if you want to turn your hand to an authentic Thai stirfry, it is a really tasty stirfry that’s quick to make and easy to eat. And it’s one that I’ll cook again. Paul liked it which was important, but I loved it as it took me right back to the kitchen in Bolton where I’d help Mum with the preparation and Dad would dig out the wok! First prepare all the ingredients, as there’s not much cooking time. Slice the chicken into bite-sized strips. Chop the garlic, seed and finely chop the chillies and roughly chop the red pepper. Top and tail the sugar snaps or mangetouts. Chop the spring onion at a slight angle to make fine shreds. Shred the basil. Mix the cornflour with the fish sauce until smooth. Heat the oil in a wok over a high heat until very hot and then toss in the chicken, garlic, chillies and stir fry for 2 minutes until the chicken changes colour. Add the red pepper, sugarsnaps/mangetouts, spring onions, ground coriander and sugar and stir fry for 4-5 minutes. Stir the cornflour mixture before pouring over the chicken and vegetables, stirring constantly until the juices thicken. Throw in the basil and remove from the heat. Serve immediately with jasmine rice. 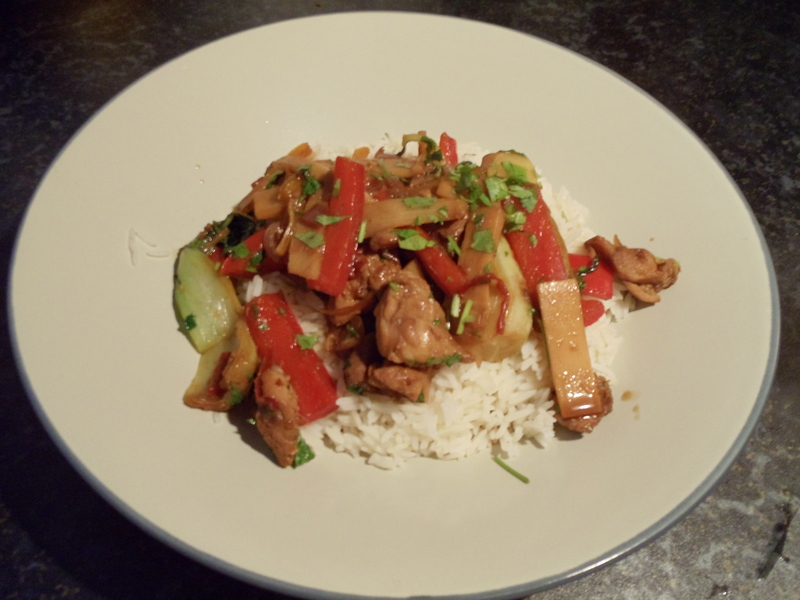 Categories: Chicken, Reidbury Recipes | Tags: Chicken, Stirfry, Thai | Permalink. I’m not sure why, but I always get some smug satisfaction when I have meat that’s marinating in the fridge. Something to do with me being organised enough to have prepared something a whole 24 hours before I plan on cooking it! One of my favourite marinaded meals is Jerk Chicken. Now, I have no idea how authentic this recipe is and can’t remember where I found it, but apparently the history of this dish is very varied and there’s a lot of flexibility on the exact spice blend anyway. But it is said there’s one rule for Jerk seasoning – don’t skimp on spices, even if you choose to reduce the heat. In my world, anything that tastes and smells as good as this is a winner! And whilst you don’t have to marinate overnight, you should definitely marinate for 4 hours minimum. Serve with Rice and Peas and add a little sunshine to your plate during these grey, winter months! Put all the ingredients, apart from the chicken, into a blender and blitz until smooth. Put the chicken into a large freezer bag and pour over the marinade. It’s helpful to place the freezer bag into a bowl to stop any leakage, and then leave in the fridge for anywhere between 4 and 24 hours. Preheat the oven to 180C and put the chicken skin side up on a roasting tray. Roast until cooked through (about 45 mins) turning over once halfway through the process. Heat the oil in a frying pan and fry the onion until translucent. Add the rice, stir well and add the water and coconut milk. Bring to the boil. Add the kidney beans and thyme, simmer, and cover, for about 20 minutes until the rice is cooked. Season with the salt and freshly ground black pepper. Serve garnished with the coriander. Categories: Chicken, Reidbury Recipes, Uncategorized | Tags: Caribbean, Chicken | Permalink. 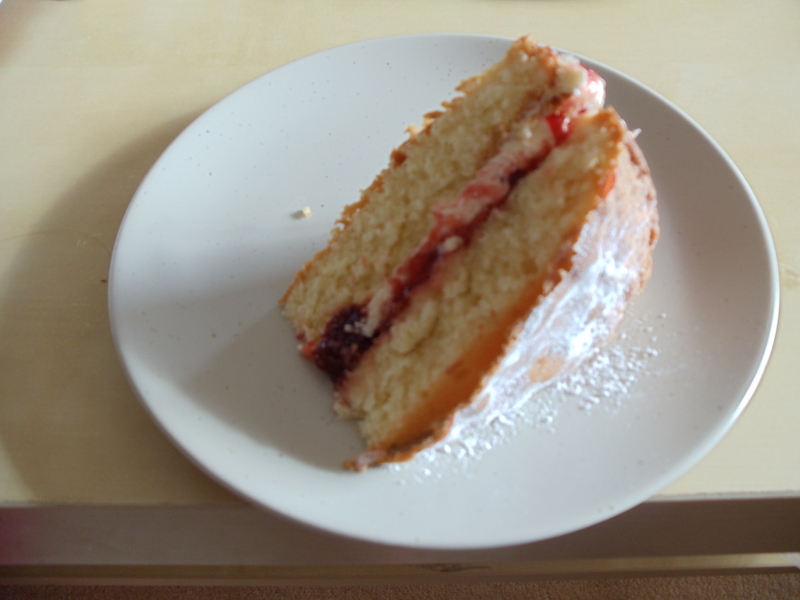 A few recipes to include today, given my lack of blog updates for a while! 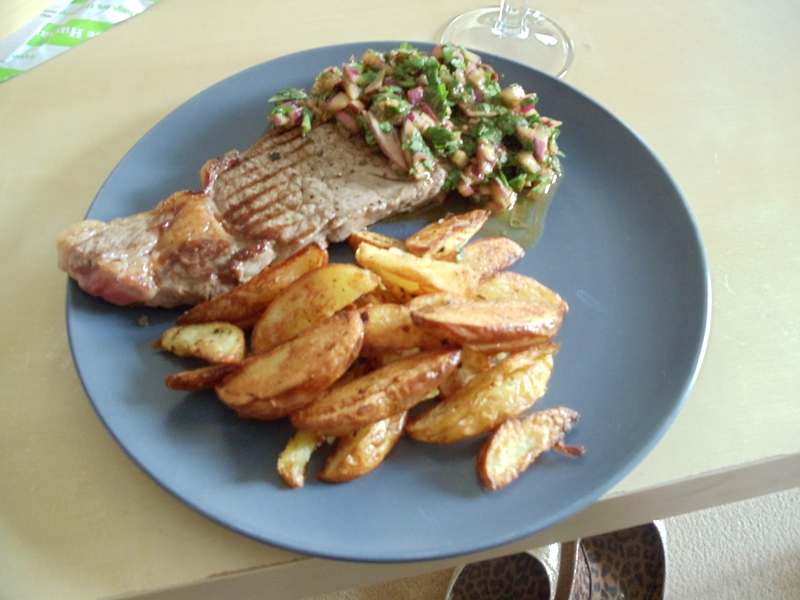 First up, two steak dishes to compare. 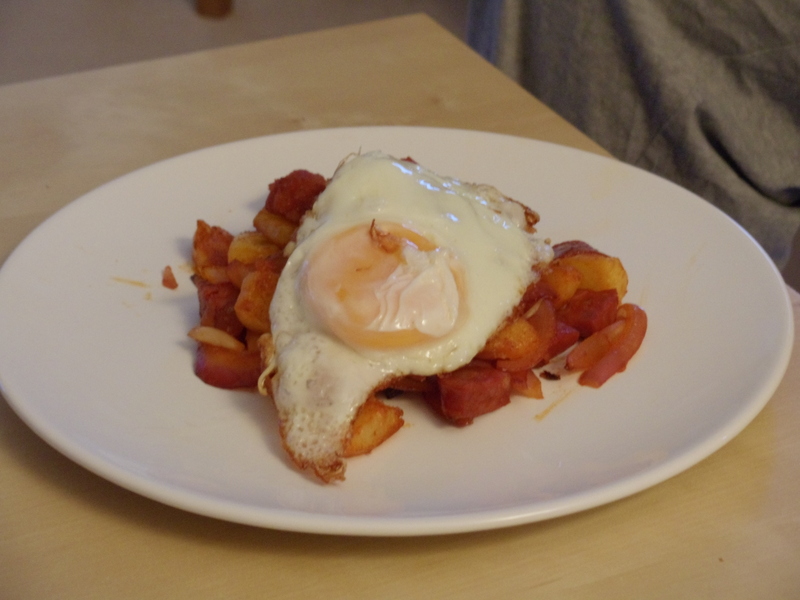 Up next was a recipe that Paul cooked for us, Spicy Chorizo Potatoes with Fried Eggs from the p.32 of the ‘£5 Supper for Two’ supplement with Olive Magazine, September 2011. The recipe only had 7 ingredients but it worked really well. Simply cook some potatoes in boiling water and drain, then fry in oil until golden. Remove from pan and add some onion and green chilli, before adding chorizo and paprika. Once cooked, add the potatoes back into the pan and serve with a fried egg on top. 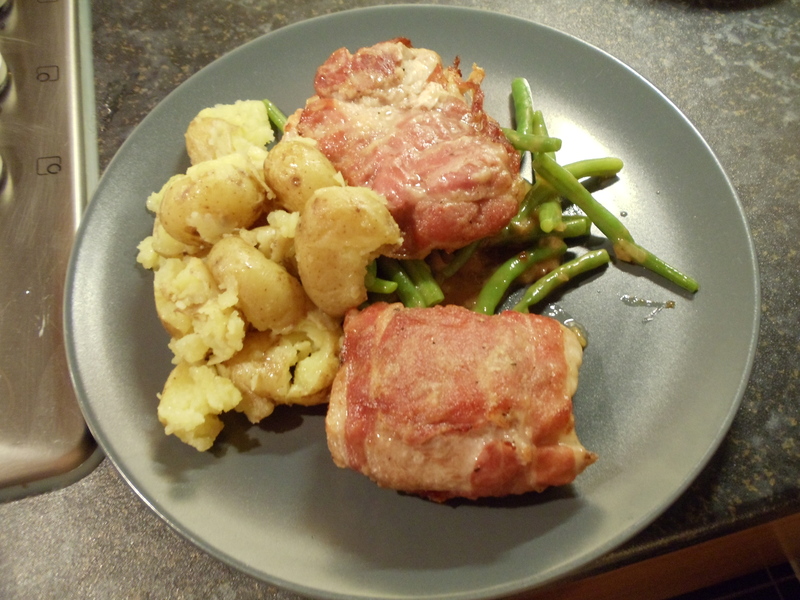 Great comfort food, stuff you’d often have in your fridge and very tasty. Nom nom nom. KB rating 8.5/10. PR rating 8/10. 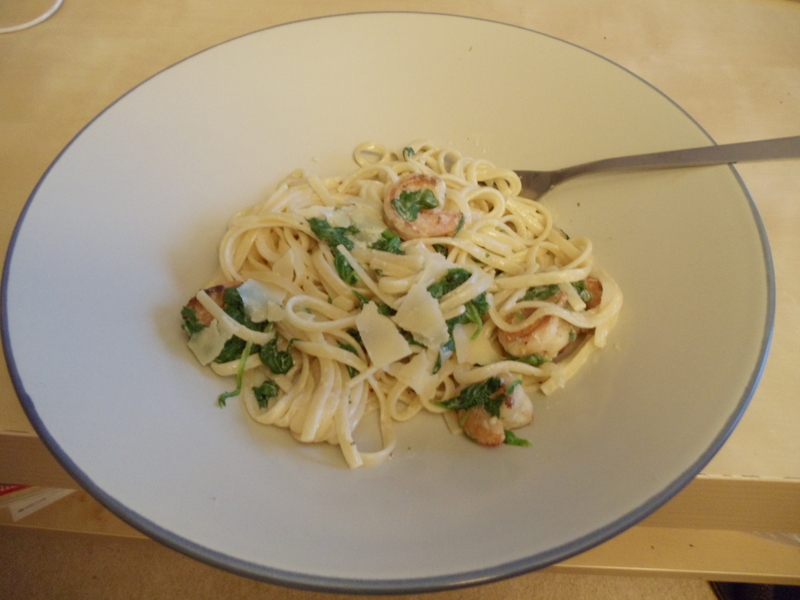 Another recipe Paul cooked recently was Linguine with Garlic, Prawns & Spinach from Gino D’Acampo’s ‘The Italian Diet’ (p. 104). 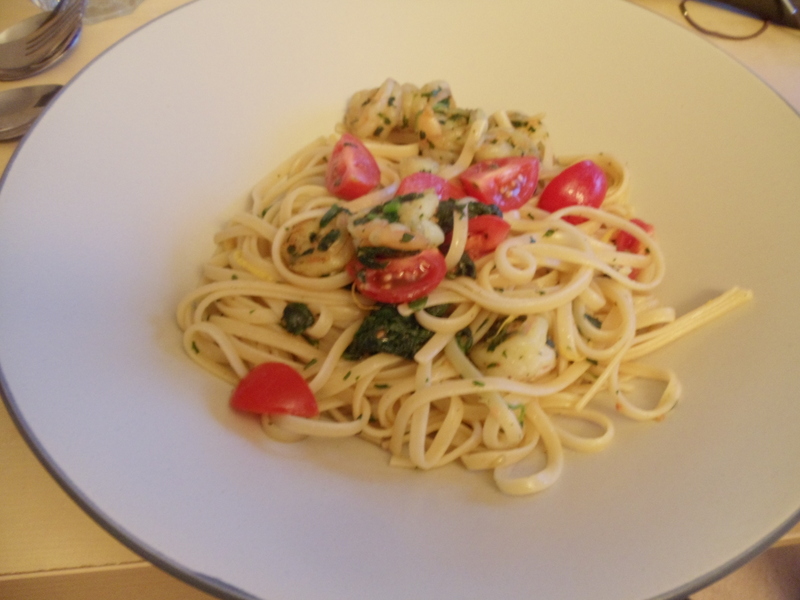 A nice pasta supper with fresh flavours (lemon, parsley and cherry tomatoes) in addition to the ingredients in the recipe title. 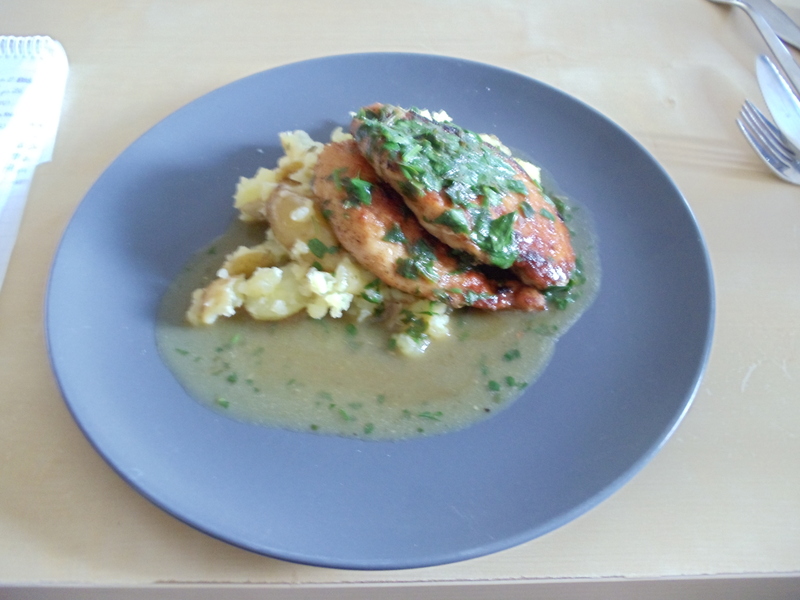 Very enjoyable but I found it strange that the recipe only used the zest from the lemon and no juice – think I’d add a bit of juice next time and increase the amount of spinach to give this recipe a bit more oomph! The prawns, however, were really juicy and full of flavour and were definitely the highlight. KB rating 7/10. PR rating 7/10. Given I’ve been feeling unwell over the last week I decided to cook two things with a view to making me feel better! 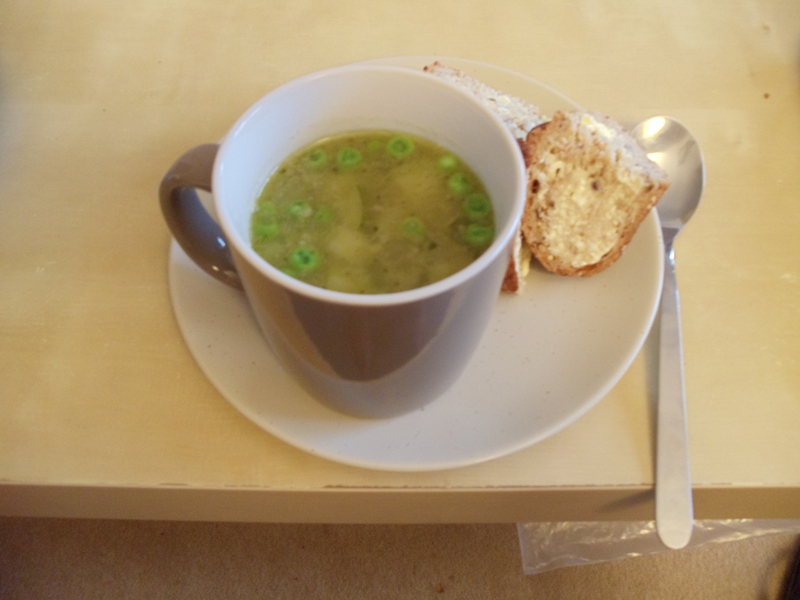 So first up was a simple soup – Summer Veg-Box Soup from Olive Magazine, June 2011 (p.44). Dead easy to make – fry spring onions and courgettes in oil (I upgraded to garlic oil to add further flavour). Add some orzo pasta before adding frozen peas, frozen broad beans and veg stock and allow the whole thing to bubble away. I got a bit carried away with adding extra orzo, so it turned out being less liquidy than it should, but that’s what I was after anyway. Serve in a mug with warm bread and I instantly started to feel better. Yum. KB rating 8/10. Categories: Uncategorized | Tags: 101 Teatime Treats, Beef, Chicken, chorizo, Delicious September 2011, eggs, Gino d'Acampo, Olive June 2011, Pasta, Prawns, soup | Permalink. A few meals cooked this week, of which a couple are Reidbury’s tried and tested favourites! In addition to the recipes that follow I should admit to a takeaway curry (featuring my new obsession – paneer cheese in ‘Mottor Paneer’ form. Paneer cheese with peas – shouldn’t work but somehow it really does) and one night of 5 types of cheese and a good bottle of red…First up this week in the genuine cooking stakes – Sicilian Sausage Pasta from Delicious Magazine, July 2011 (p.34). 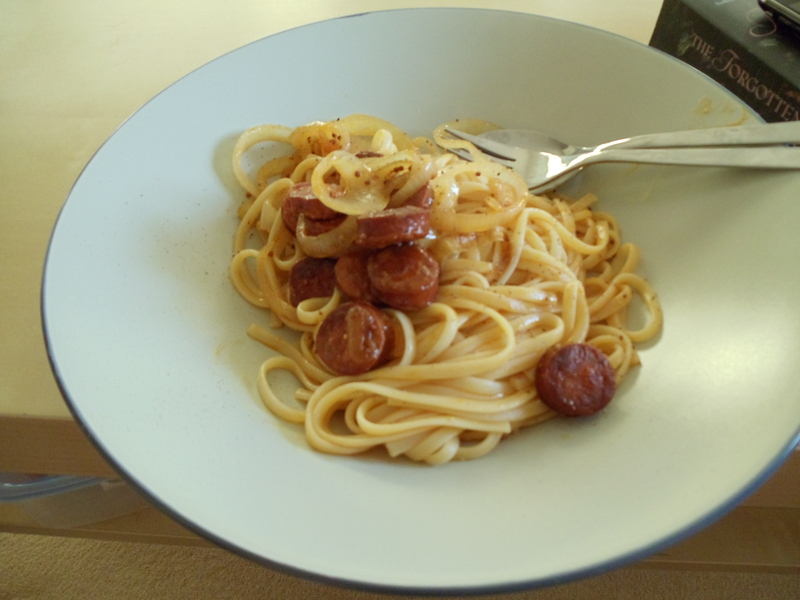 A relatively simple pasta recipe that I hadn’t tried before. It works well as a ‘I’ve just got in from work, don’t want to reduce myself to a takeaway…what can I conjure up myself’ recipe. It uses sausage meat (easily squeezed from their cases), tomatoes, lemon, chilli, creme fraiche and Parmesan to create a fresh pasta sauce. Enjoyable but it felt a little thin on the ground with regards to taste – I think i’d up the chilli quota next time. Good meal to create when you’re a bit tired and uninterested. KB rating 6.5/10. PR rating 7/10. Last recipe this week was another Reidbury favourite. Definitely in our top 3 homecooked meals at the moment – Harissa Chicken Kebabs with Spring Fattoush and Couscous, from Olive Magazine, April 2011 (p.66). There’s something about this recipe that means the whole is greater than the sum of its parts. The harissa chicken is straighforward enough – chunks of chicken breast marinated in harissa and olive oil. But somehow grilling this on skewers makes the chicken really flavourful and moist. The spring fattoush incorporates cucumber, radish, lettuce, spring onions, mint and toasted pitta bread with a simple dressing of garlic, oil, sumac and lemon juice. Served with simple couscous and the whole meal is amazing! KB rating 9/10. PR rating 9/10. Finally Paul and I went to Su Sazzagoni in Victoria Park for dinner on Friday. I really enjoyed the honest, Sardinian ambience and menu and particularly enjoyed the Spritz aperitif (currently one of my favourite drinks – either dry white wine or prosecco with Aperol and sparkling water – usually served with lots of ice and slice of orange). Out of 4 dishes (2 starters and 2 mains) only one really stood out – Paul’s simple-sounding starter of pasta with sausage. I did enjoy both of my dishes but felt a little disappointed – the seafood skewer didn’t have enough flavour and the prawns were mushy. My main of tuna was lovely but the bland salad didn’t offer enough contrast. 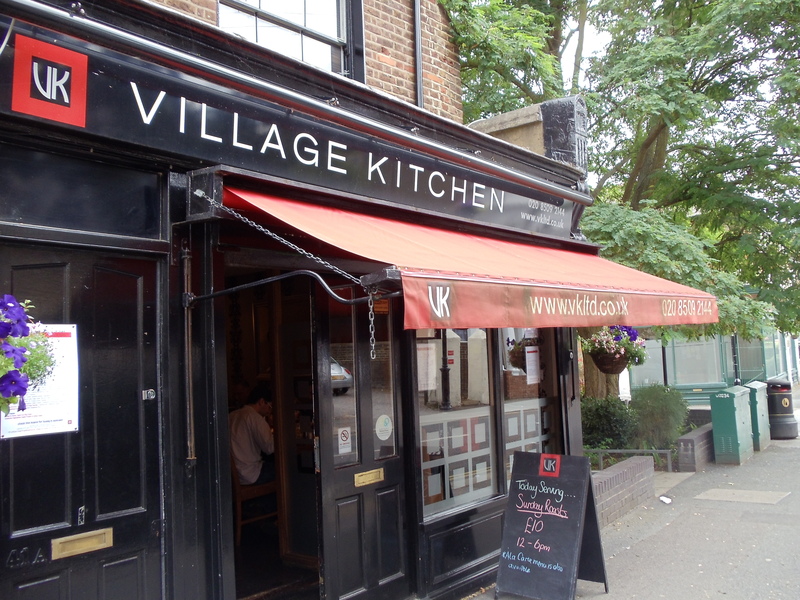 I would go back again but I’d stick to their pasta and pizza rather than the grilled seafood as I’d been advised previously. Categories: Uncategorized | Tags: Chicken, chorizo, Delicious July 2011, Nigel Slater, Olive April 2011, Pasta, Real Fast Food, Restaurant Review, sausage | Permalink. Another busy week, but more due to long hours at work than for fun reasons unfortunately! Paul and I went to watch Bridesmaids mid-week though and had a lovely meal at Wagamama beforehand. Their Raw Salad starter is one of my favourite dishes from a High-End Chain and I get ridiculously virtuous cravings for it now and then – it definitely hit the spot! Our other non home-cooked treat this week was a huge plate of Fish and Chips! After getting absolutely drenched watching the British Open golf on Saturday and spending 2 hours getting home we wanted some comfort food. Nothing ever beats fish and chips with mushy peas, along with a huge cuppa! Mmmm! Categories: Uncategorized | Tags: Chicken, Olive August 2011, Parma Ham, Pasta, Prawns | Permalink. Well this week I’ve cooked a lot less than usual – Paul and I were only at home together one weekday this week due to various plans (including me watching Take That – screeeeeam!). However, I cooked two meals worth noting. 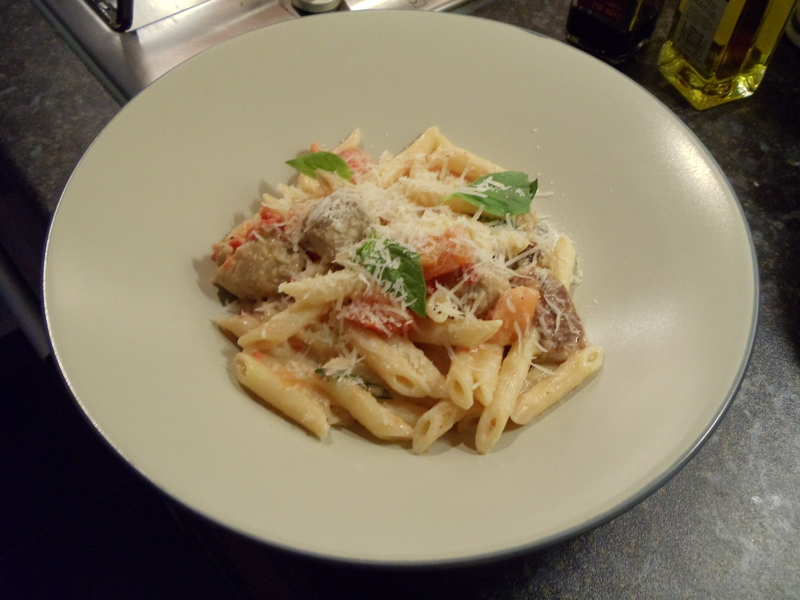 The first was Pork, Lemon and Herb Meatballs with Orzo Sald from Olive Magazine, August 2011 (p.50). We’ve had some hit and miss meatball recipes over the last year but this one was an absolute winner! Really simple recipe but somehow it tasted way better than the sum of its parts – in the meatballs just pork mince, red onion, lemon and parsley with LOTS of seasoning. It’s served with an orzo and rocket salad (though I omitted the rocket and just had the orzo with red onions, lemon and oil) and a herbed yoghurt. I made a huge batch of the meatballs and they lasted us for 2 huge portioned meals! 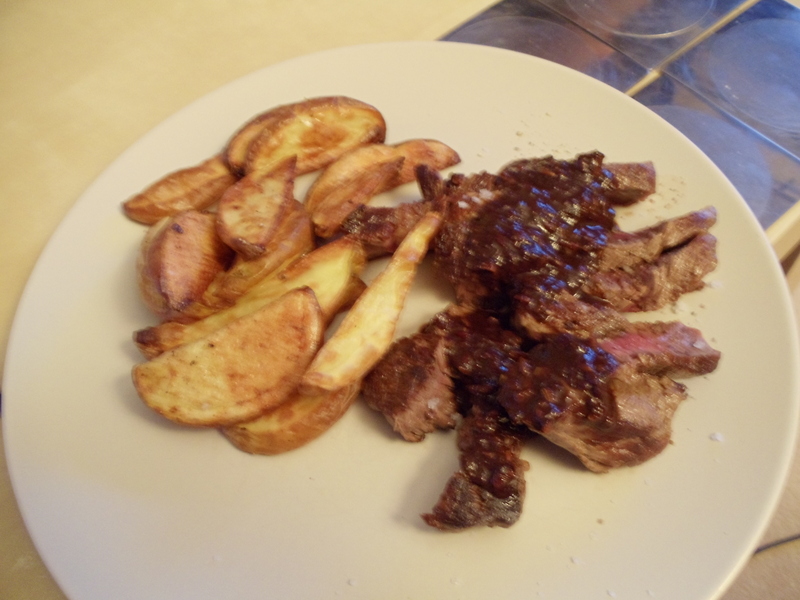 Really light, simple recipe and one that I’d definitely do again. KB rating: 9/10. PR rating 8/10. That’s all for this week – hopefully I’ll get a chance to try out some more recipes next week! Categories: Uncategorized | Tags: Chicken, Delicious August 2011, Olive August 2011, Pork, Restaurant Review | Permalink.